Tara Markov is a girl who has power over earth and stone, and she is also more than she seems. Is the newest Teen Titan an ally or a threat? For the newest DC Comics direct-to-video animated adventure, we go to 2017’s Teen Titans: The Judas Contract. In a prologue, we see the Teen Titans rescue an alien princess named Starfire (voiced by Kari Wahlgren) and give her a new home. Five years later, Starfire acts as the leader of the Titans and helps the team deal with the integration of a new member: Terra (Christina Ricci). The rookie Titan struggles to fit in with the group and creates some concerns, as her allegiance seems uncertain. In addition, an immortal megalomaniac named Brother Blood (Gregg Henry) causes woes. Blood hires the mercenary Deathstroke (Miguel Ferrer) to deal with the Titans, and this leads to inevitable conflict. Even when I was a teen myself, I never felt wild about the Titans. I think some of this was because the group felt “dumbed down”, as the Titans seemed like a self-conscious attempt to appeal to a younger demographic. At least as represented in Contract, I can’t make that same claim, as the “PG-13” rated movie gives us a more “adult” experience than I recall from the comics. The film throws in a bit of profanity and sexual allusions as well as moderately graphic violence, all of which ensure it won’t play for the pre-teen crowd. Does this mean Contract works for adults in the audience? Not really – while not a bad effort, the film seems fairly forgettable. Most of the problems stem from the less than coherent plot. Contract mixes elements related to Deathstroke and Blood in almost a random manner, so the overall narrative doesn’t hold together all that well. We get the greater connection between the two sides but the package can’t mesh in a satisfying manner. Contract also doesn’t develop its characters especially well. Terra takes the most complicated path but I can’t claim her journey presents surprises, so her side of the tale lacks real drama. The others feel like props in the overall picture. Contract fills out the film with mild attempts at character intrigue but we don’t really care about what happens. The movie moves along in an ambling manner without a lot to make it stick with the viewer. Again, I don’t find Contract to provide a poor film, as it boasts just enough action to sustain my attention. However, it doesn’t ever threaten to become more than a sporadic pleasure. Footnote: at the finish of the end credits, you can find a little teaser. 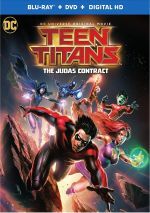 Teen Titans: The Judas Contract appears in an aspect ratio of approximately 1.78:1 on this Blu-ray Disc. This became a strong presentation. Only a smidgen of softness appeared, and that was result of the inexpensive source animation. Overall accuracy varied from very good to excellent, with an emphasis on the latter. No issues with shimmering or jaggies materialized, and I saw no edge haloes or noise reduction. Of course, I found no print flaws here. In terms of colors, Contract went with a mildly teal and orange feel. Those choices didn’t overwhelm, though, and the tones looked positive overall. Blacks were deep and dark, while shadows looked smooth and clear. This was a well-rendered image. When I examined the DTS-HD MA 5.1 soundtrack of Contract, it created a fine sense of action. The movie packed a lot of battles and involving material, and it used the five channels to impart that information in a lively manner. Explosions and fights filled the channels to create a full spectrum, and quieter elements fleshed out the room as well. Across the board, the material sounded good. Speech remained distinctive and concise, without edginess, and music seemed vivid and full. Effects appeared accurate and tight, with clear highs and some powerful lows. All in all, the mix worked nicely. As we move to extras, we find two featurettes. Tiitanic Minds: Reuniting Wolfman and Perez runs 27 minutes, 35 seconds and involves New Teen Titans creators Marv Wolfman and George Perez. They discuss their relationship and work together, with some emphasis on their original Judas Contract story. We learn a lot in this charming, engaging chat. Villain Rising: Deathstroke goes for nine minutes and features Wolfman, Perez and DC Entertainment Animation Creative Director Mike Carlin. They give us notes about the creation and development of the Deathstroke character in this tight and informative piece. The set also includes Sneak Peeks for three DC Universe animated films. A take on Superman/Batman: Public Enemies fills seven minutes, 48 seconds and provides notes from DC Comics SVP Creative Affairs Gregory Noveck, executive producer Bruce Timm, script writer Stan Berkowitz, director Sam Liu, voice/casting director Andrea Romano, and actors Tim Daly, Kevin Conroy, Xander Berkeley, LeVar Burton, John C. McGinley and Clancy Brown. They tell us a little about the production and performances, but mostly they just talk about the story and how great it’ll be. This program remains nothing more than promotional material. New to the set, a look at Batman and Harley Quinn lasts nine minutes, eight seconds and brings us comments from Carlin, Conroy, executive producer Bruce Tiimm, voice director Wes Gleason, co-writer Jim Krieg, and actors Melissa Rauch and Loren Lester. They give us notes about what to expect from the upcoming animated movie. It’s a promo piece but it sets the table well. Finally, we find a sneak peek for Justice League: Flashpoint Paradox. It spans 10 minutes, 39 seconds and involves Romano, Krieg, DC Chief Creative Officer Geoff Johns, DC Entertainment co-publisher Dan DiDio, co-producer Alan Burnett, director Jay Oliva, producer James Tucker, and actors Justin Chambers, Kevin McKidd, Michael B. Jordan, Nathan Fillion, and Dana Delany. Like the Public Enemies piece, this one consists of little more than attempts to sell the program to the viewer. 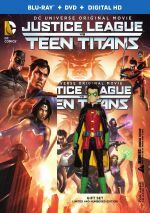 The package also includes two episodes of the Teen Titans animated series. We get “Terra” (21:43) and “Titan Rising” (). Both from 2004, the shows both focus on the Terra character, though they connect to Judas Contract via the inclusion of Deathstroke as well. Titans opts for an anime-imitative style, right down to the chirpy theme song. I’m not wild about that format and the shows seem sillier than I’d like. Still, they’re an interesting addition to the package. The disc opens with ads for Wonder Woman (animated) and Wonder Woman (2017). Trailers adds promos for Justice League Dark, The Jetsons and WWE and Injustice 2. A second disc provides a DVD copy of Contract. It includes the three “Sneak Peeks” and the trailers but lacks the other extras. As a kid, I lacked a lot of interest in the Teen Titans, and The Judas Contract fails to alter that feeling. While the movie gives us enough action to offer mild entertainment, it never becomes anything memorable. The Blu-ray provides good picture and audio along with an average set of supplements. Maybe someday a Titans adventure will enthrall me, but Contract doesn’t do that trick. 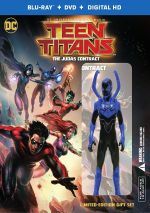 Note that this version of Contract is a “limited edition” that includes a Blue Beetle action figure. The same Blu-ray DVD combo is also available on its own without the figure for $5 less.